This is the story of one branch of the Cassidys originally from Drumbar, a townland on the outskirts of Donegal Town, County Donegal, Ireland. The story begins with my great grandfather John Cassidy, who was born in Drumbar in April 1802. At the time of writing, little is known about the family, except that, according to the Spinning Wheel Premium Entitlement Lists of 1796, when free spinning wheels were given to a number of households that were growing flax, one of them was John Cassidy (Drumbar), who was probably my great great grandfather. Under the Tenement Act of 1842, a national system of land taxation was introduced. This was based on an estimation of the valuation of land or property of each landowner or householder. A survey of all landholders was conducted in the 1840s and 1850s. The valuation was supervised by Richard Griffith and even today it is referred to as Griffith’s Valuation. This report lists nine Cassidy families in the Donegal Town area. They were Anne Cassidy of Ardatowel, Owen Cassidy of Main Street in Donegal Town, two Francis Cassidys of Drumbar, two widow Cassidys of Drumbar and two William Cassidys of Drumbar. As Catholic schools were forbidden by law, John Cassidy’s only formal education was gained through attending what was known as a “hedge school.” These were usually held in the open fields behind a hedge. During his teenage years, both he and a relative worked as farm laborers for two landowners in the Donegal Town area. When his relative decided to marry the landowner’s only daughter, it caused quite a problem for all concerned. Like the laws governing the schools, Catholics were forbidden by law from becoming land owners. To overcome this problem, John Cassidy’s relative joined the church of his bride-to-be – the Church of Ireland. In doing so, the rest of the Cassidy family ended all contact with this member of the family, and so it has remained, until now. Hopefully my research will lead to a reunion of all the Cassidys of that period. When one of John’s sheep went missing during the first famine years (1831-33) he undertook an extensive search of the locality. He eventually found the horns of the animal that had his markings at the rear of a cottage that was rented by a woman known as the widow Kelly. Mrs. Kelly had two sons who spent their time stealing from their neighbors. When John Cassidy confronted them, they denied having any involvement in the disappearance of the animal. Shortly afterward, the Kelly family decided to immigrate to the United States. The day they were leaving, the Kelly brothers paid a visit to John Cassidy’s home where they proceeded to give him a terrible beating that left him confined to bed for a number of weeks. In the spring of 1838, John Cassidy’s oldest son, also named John, boarded a sailing ship called the Zephyr that was anchored at the Hassins in Donegal Bay and sailed to New Brunswick, Canada. From there, he made his way to New York where the Kelly family was living. One morning, as one of the Kelly brothers was standing on a railway station platform, he failed to notice his former neighbor standing behind him. As the train entered the station, John Cassidy pushed him in front of the train. As there were many witnesses present, John fled across the US. He settled in Seattle, where he worked on the construction of the Seattle/Montana railway. Little else is known of this member of our family, except for an unconfirmed report that he served as a town sheriff in Butte, Montana. John never returned to Donegal. As already mentioned, their oldest son, John, immigrated to the US, as did their daughter Hanna. –Frank Cassidy (1835-1899) was born in Clogher and married Sally Freel (1836-1912) born in Inver, County Donegal, daughter of Francis Freel and Katie McCracken. Francis and Sally lived in the townland of Aughlim, County Donegal. They had 10 children, and most of their descendants now live in the United States. –Jane Cassidy (1840-1926) married Patrick Meehan (1840-1930) born in Inver, County Donegal, son of James Meehan and Sally Freel. Jane and Patrick lived in Dooring Point, Inver. They had 12 children, and their descendants are to be found in various Irish counties and in the US. –Sara Ann Cassidy married Brian Meehan, brother of Patrick Meehan, shortly after they were married. They immigrated to Georgia in the United States. They had four songs. The youngest member of John and Kitty Cassidy’s children was my grandfather Hugh, who was born in Clogher in 1851. In 1858, at the age of seven, Hugh began attending Ardeeven National School. The following year, the landlords closed the school because the local tenants refused to pay higher rents that were being demanded of them. History was repeating itself like his father before him. The rest of Hugh’s education was gained through the hedge school. Hugh would later become a teacher at one of those hedge schools. Sometime in the 1870s, Hugh immigrated to the US. He lived and worked with his brother John in Seattle. On his return to Clogher, he built a new house. It was the first house in the parish to have a slated roof and two upstairs bedrooms. This house was the family home until a new house was build in 1986. To the left of the house, Hugh had a garden where he grew his potatoes and vegetables. It also had apple, pear, strawberry, and gooseberry trees. But pride of place went to this favorite dish, the rhubarb patch. Hugh also planted 60 trees, most of which are still growing today. As already mentioned, Hugh’s first wife, Ann Mulreany died the year after they were married. His second wife was Mary Ann Kennedy, born 1866 in Inver, County Donegal, one of 10 children of Charlie Kennedy and Madge Gildea who was born in Clogher. Hugh and Mary Ann had seven children – five boys and two girls. All five of their sons served either in the army or police, and in some cases, both. –Charlie (1892-1976) R.I.C./British Army, France 1916-18. On his return, he served in the Liverpool Police. Charlie’s four sons served in both the armed forces and the police. John and Frank in the army, Jerry erved as soldier and policeman. Charlie served in the R.A.F. during World War II. He was shot down over Belgium in 1942 and spent three years in a prisoner of war camp. –Tom (1904-1927), member of the Irish Republican Army 1918-22. 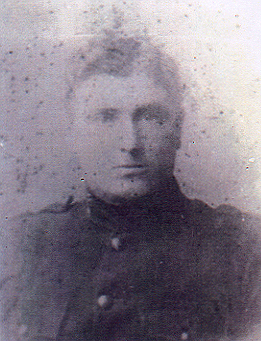 He was one of the first to join the newly formed Irish Police Force (An Garda Siochana) in May of 1922. He was promoted to sergeant in September of that year. Sadly, Tom died in 1927 at the age of 23. –Dan (1909-1987), He spent three years in the Irish Army 1928-1931. That tradition of service has been continued into this generation by Hugh’s grandsons Danny Cassidy, who served in the Irish Guards, and John, who is a member of An Garda Sichonna in Donegal and his great granddaughter Patricia Hegarty, who is an officer in the Metropolitan Police Force in London. Hugh and Marry Ann’s daughters were Annie (1899-1949) married Connal Thomas (1882-1947). They lived in Edergole, in the parish of Killymard, County Donegal. They had six children. Catherine (Kitty) (1902-1977) married William Hegarty (1896-1968). They lived in Donegal Town and had six children. In compiling this family tree, I would like to put on record the enormous contributions and personal sacrifices that were made by the Cassidy women down the years. For example, whatever land was available was shared among the sons. The daughters had only two options: they could get married, provided they had a dowry (i.e. money or cattle). Even when married, their troubles were far from over. Firstly, they were expected to share the workload of the farm. Saving hay/turf, milking cows, etc. plus all the household chores. They would also be expected to give birth to at least six children. As healthcare as we know it was unheard of back then, each birth could mean death of the mother. Indeed, it was common practice to save the child at the expense of the mother. The daughters’ second option was immigration, usually to the United States. For some, it meant never seeing their family again. Even in this new world, the daughter was at a disadvantage. Whereas the men worked in the construction industry with their fellow countrymen, the women were employed as housemaids or in factories and found themselves working and living among strangers. This did not stop them from playing a pivotal role in the well-being of their family back home. They used their money to help pay the rent, later to buy the smallholding, provide a dowry for a sister, pay the passage of a family member traveling to the US. Bust most importantly, once married, they ensured that their children received the best possible education. By 1922, the people of Ireland had lost all faith in British justice. The dominant political force in the country was Sinn Fein, who set up their own courts. One of the people who served as a court judge in Donegal was Hugh Cassidy. In 1986, a group of barristers were asked to study the decisions reached by the judges of that period. They concluded that, although these men had no formal training, their decisions, which were based on commons sense rather than the rule of law, were in most cases correct. One of the many regular visitors to the Cassidy household and close friend of Hugh Cassidy was a man named Mickey Brown. Mickey’s wife died at a young age. They had four children who were reared by relatives in Ballybofey, County Donegal. It has been said but not yet confirmed that his graddaughter is Rosemary Brown, born in Derry, better known as Dana, well known singer and presently member of the European Parliament. My grandfather died on December 4, 1946 at the age of 95. He was laid to rest with his parents in Clar. This is also the final resting place of his first wife Anne Mulreany, his daughter Annie, sons John, Tom, and Dan. My grandmother died in 1952. Her grave is located at the top of the hill, at the rear of Clar church. This is also the final resting place of my parents, William and Kathleen Cassidy. The grave is marked with a white headstone bearing their names. This is but the beginning of this family history. Today the descendants of John and Kitty Cassidy are to be found in the four corners of the world and it would be impossible for any one individual to compile a family tree that would include them all. Such a task can only be achieved with the help of each family unit. It is my dearest wish that this goal will be achieved.